Complete Hearing Solutions is a hearing loop systems installation and distribution company holding a Florida Limited Energy Systems Specialist License, #ES12001411. 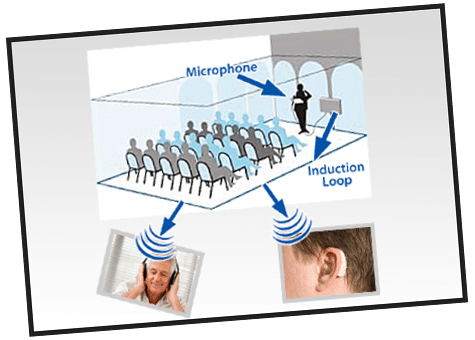 We provide the complete design and installation of assistive listening systems, designed to work seamlessly with telecoil hearing loops, in any commercial venue. We also serve as a distributor for the manufacturers of the Loop equipment we use which allows us to consult with and provide equipment and installation design and engineering to sound contractors, A/V contractors, Loop installers, and architectural firms. This website serves to provide information about Hearing Loops, the benefits of Hearing Loops, and the importance of Hearing Loop installations throughout the State of Florida and the whole of the US. If you are interested in additional information regarding Hearing Loops or would like to communicate directly with us regarding Loop related questions, please go to the Contact Us page.